A teenager and a man in his 60s, who died after a fishing boat capsized off Malin Head in County Donegal, have been named as Thomas Weir and Gerry Doherty. Mr Doherty was from County Donegal while Mr Weir was from Dalkeith in Midlothian in Scotland but had been living in Londonderry in recent months. A third man, in his 50s, was rescued after being found clinging to a buoy. He has since been discharged from hospital. It is understood there are family connections between the three. It is understood that they were in the water for four hours by the time the alarm was raised. Holidaymakers called the coastguard after they heard shouts and saw them in the water on Tuesday afternoon. Thomas Weir, who was 16-years-old, died in Altnagelvin Hospital after being airlifted from the sea. Gerry Doherty was found on the shore and pronounced dead at the scene. The third man, who is also from Derry, was taken to Altnagelvin Hospital after being rescued from the sea. 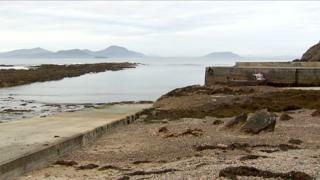 It is understood the small boat capsized after it left the coast at about 09:00 BST on Tuesday. Joe Joyce, from Lough Swilly RNLI, was one of the crew members involved in what he said was a "massive operation", which involved 40 emergency service personnel. He said two visitors who were staying near the pier at Portronan raised the alarm at about 15:30. A coastguard boat, two lifeboats and a rescue helicopter were sent to the scene. "When we arrived on the scene we learned that the people were in the water for about four hours," said Mr Joyce. "They had got into difficulty at about noon when their boat became swamped and they capsized. "A young teenage boy was subsequently lifted by the coastguard helicopter and taken to Altnagelvin. "A local boat found the man in his 50s clinging to a buoy and subsequently, about an hour and a half later, the third person was found washed up on the shore under Banba's Crown, a rocky outcrop there." Mr Joyce said conditions at sea were "very favourable" but that Malin Head has some of the most "treacherous waters in the world". "You always dread when a rescue becomes a recovery," he added. "Without the help of the local fishing boats that answered the cry for help from the mayday, the outcome probably would have been worse. "But we console ourselves on the fact that we were fit to bring everybody back to shore."